Nigeria, with a total of over 250 ethnic groups, is one of the most ethnically diverse nations in Africa. Despite this ethnic diversity, it is mostly bi-religious, where its people are either Christian or Muslim. The remaining four percent comprises of other indigenous religions and non-believers. Due to this, we have given much thought on how to bring people of these two major religions together and convey to them the ideals of true love and unity with the hope of improving our nation. In taking a bold step to this endeavor, CARP Nigeria held its 2nd 7-day Divine Principle workshop where participants from both Christian and Islamic backgrounds were invited. 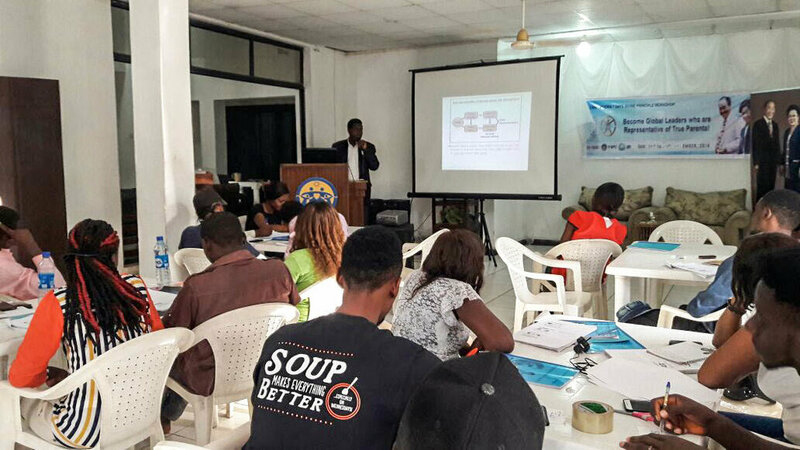 The workshop was held at the Peace Embassy in Abuja from December 18th to 25th, 2016 with the theme, “Become Global Leaders who are Representatives of True Parents.” The workshop had a total of 25 participants which included 17 students from the University of Abuja community and eight core CARP staff. The workshop was organized for CARP members who were unable to participate in the previous 7-day workshop. The aim of the workshop was to get participants fully acquainted with the Divine Principle and the role of young people in building a new Nigeria centering on the teachings of Father and Mother Moon as the True Parents of humankind. Another major intention of this workshop was to raise up core members from various religions who could work together. We tried to do this not only by educating them with the Divine Principle but by encouraging experiences of sharing, working together, and fostering an attitude of acceptance towards one another despite individual, religious, or ethnic differences. During the workshop, participants were grouped into four teams, each bearing a letter in the team name from the acronym C-A-R-P. A typical day included morning devotion, exercise, cleaning, 3-4 lectures and recreational activities. We had great lecturers like Rev. Moses Akaahan and Rev. Sunday Uke who gave insightful presentations on the Principle as well as Rev. Shang Seong Park who taught Father and Mother Moon’s life course and the significance of the marriage blessing in unifying the world. Recreational activities in the evenings offered time for fun after listening to lectures all day and included indoor games, team sport activities, movies, A STEP UP session or family night with Open Mic and team entertainment performances. The success of this workshop did not come without its own share of challenges. Raising the necessary funds for the workshop to run successfully took a great deal of investment on the part of the core staff who began fundraising for the workshop a month in advance. It was not easy to fund an entire seminar like this especially in a nation currently faced with economic recession. But through the determination and dedication of our core staff headed by Mr. Bok Jin Lee, Nigeria’s Youth Special Envoy, we raised enough funds to make this workshop a reality. It was also challenging to create and plan a workshop that would be meaningful to everyone and bring unity regardless of religious background. One of the highlights of this workshop was the ‘True Love Sharing Ceremony’ that was held on the final evening of the workshop. Half of the participants sat on the floor with their eyes closed and the rest of the participants stood around and proceeded to show love to the seated participants through non-verbal gestures such as hugs, pats on the back and brief shoulder massages. The participants then switch so that everyone gets a chance to be appreciated. The participants were moved by the love they were receiving and many tears were shed. It was a beautiful moment. This workshop showed us that there is no better time than now to spread positivity and true love to young people around the country. Many participants expressed interest in learning more so that they could also reach out to other young people of both Christian and Islamic backgrounds and work together to bring hope to Nigeria.